MRTMarkets.com is owned and operated by AF TECHNOLOGIES LTD based in England. The company was founded by economists with an extensive experience in the foreign exchange market. Clients can trade 38 currency pairs, a virtual currency (BTC/USD), CFDs on indices (NASDAQ, Dow Jones etc. ), and metals. Trading is conducted on the MetaTrader 4 platform, which is also available through mobile devices. The broker offers various services including free training. Clients can learn how to trade by themselves as well as together with the company's experts who give trainings and webinars. Traders have an opportunity to use ready-made strategies and trading signals, improve their trading skills on a demo account, become an Introducing Broker or take part in two other partner programs. There are four account types: Standard, Gold, VIP, and Islamic. In order to get information about the trading conditions, clients need to contact the company's managers. Additional services include trading signals which can be used by beginning traders who do not have much experience in trading. Trading signals are recommendations on what time to trade and what kind of deals to make. There is also another service, Algo Trading, that helps clients gain income from pre-programmed scenarios such as timing, price, or quantity of the order. The customer support works 24/5. The broker guarantees that any request to withdraw money will be handled and reach the customer within 7 working days. The official website is available in Russian, English, Polish, Arabic, French, and Italian. MRTMarkets is the worse broker in the history of forex. I start to work with real account 4 months ago and deposited $550. After one month’s trading I was stuck with my family urgency. That why I was unable to trade to last three months. Last week when I login my client cabinet they I found they charged 50$ as a inactivity fee and do not notify me about it. Even I do not find any teams and condition about inactivity fee. Not sure if this were improved recently. It’s a headache. I was a trader at MRTMarkets and my initial capital was $1000. MRTMarkets gave me an account manager. At first, it was all good. He was telling me tips that are really helpful and most of time, when he tells me to open a position, it becomes a winning trade. It went on that way until one day he proposed that I give him the permission to do the trades for me. Because he showed me good performance and since he already got my trust, I allowed him. But that decision was wrong. The moment I gave him the permission, he started to wreak havoc. All of the profit we earned and almost all of my capital were gone. Of course, I already raised this concern to them but they were nonchalant about it. They just don't care about their traders and in the end, my account was closed. 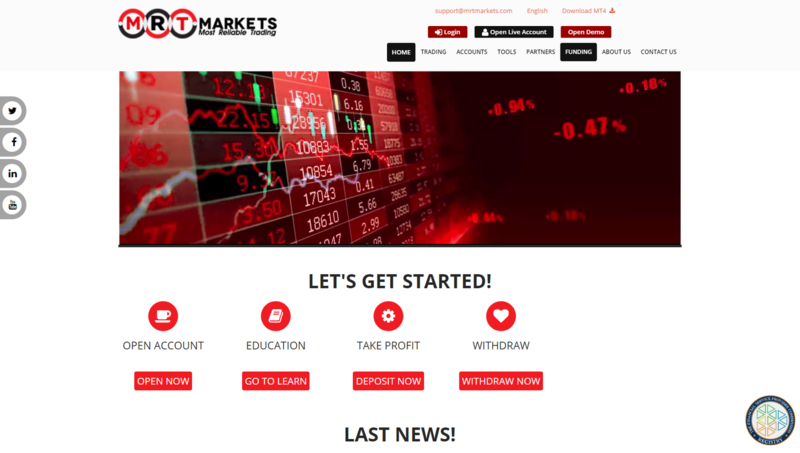 When my brother invite me to join MRTMarkets.com I feel interest because no minimum account size and they provides educational services, up-to-date newsfeeds, and analytical articles. Finally I do the registration and activate the real trading account at this broker. But when I am going to make a deposit for the first time, I feel very surprised because they set swap. As a Muslim basically I want to do trade whose broker who has Swap free account, but they does not have it. So for now I will not make deposit and trading until free swap is available in this broker. I am a newcomer to MRTMarkets broker, last week I was trading BTC at logical margin and leverage, what is this? I think they do it intentionally. Also, I had some running trades EURUSD, GBP/USD pairs but after the last weekend market open with some gap, when I checked these traders saw that the orders were closed by hit by stop out. so I decided to closed account and plan to withdraw which i have deposited via Skrill, but they had canceled my transaction too. While immediately I have connected to MRTMarkets support team, but hey refused to do anything. Now I am disappointed with them and tried to complain to their regulator with my evidence. Mrt market is a pure scam which I have realized after spending 2 months with them. They actually DELETED winning trades. I called them up to inquire and they flatly denied ever doing it. I attempted to show them my records from MT. They claimed I had faked them. They advertise no dealer intervention. I lost about $300 while trading on major currencies. And the most bitter of is that, they don't intervene when you are trading, only when you are finished trading! Today, 2 live trades and 2 lost today happened because of crash on MRT market platform. Last week they already closed my order and also my stop loss without any proper notification. I lost almost half of my equity and now only left $372. One more, login to MT4 sometime failed and have to re-login so many times. I noticed that, it will happened when news released out. There is nothing to do with the support team. In fact, I already wrote an e - mail concerning about the order cancellation made by their side. They supposed to give reason or at least to return back the money to my account. It’s time to withdraw all the balance in account and left this broker before all gone. I decided to join trading in MRTMarkets.com because they don't set a minimum account size and their spread is fixed at 2 pips. For over 5 month of trading, MRTMarkets.com is the worst broker with stable trading program. But I was having a hard-time to deal with their operator and support team, since I use their new platform. Its freezing all the time and there are many requotes. I have lost almost $550 during this issue on the platform. I started to think that this broker is nothing but crook! I hope they stop cheat traders. I've been with MRTMarkets for about 2 months now and I am a novice trader. I experienced a lot of connection problems and it has caused me a catastrophic loss. Sometimes they close orders and stop losses which could not execute when I applied them. On a single trade I lost 60% of my equity. The platform is good when it works, but it frequently crashes or you have to login again, and this happens especially when the volatility in the market is high (news releases etc...) With regards hunting stops, I have written on more than one occasion to their customer support to point out the spikes but they didn't respond at all or it was full of lies. If this issue will not be solved. I will not only remove my cash, but will make it my mission in life to post comparative charts of them versus everyone else. Fair warming to you and others, DO NOT trade with this broker, again, I am speaking from personal experience.. I was about to refer some of my friends to be able to get a commission or rebates when I discovered my trading account is not accessible anymore. Don't really know why my account got disabled, because I invested my own funds and am sure that I never violate any of the trading rules stated in the Agreement. Yesterday, I used the same trading method that I have used since November 2016. I close the three trading instruments (eurusd Usdchf and gbpusd) after 30 minutes and earned for about 25 USD and now, my account is gone. I couldn't access my Standard account anymore for the unknown reasons. Already checked the emails, but no messages left from this company. Why they would do that? I did nothing! I need an explanation on this! If they won't activate my account, nor refunded back the money that I left in my account, I would take a legal action. I decided to give MRTMarkets a try to check their trading conditions, execution and so on. But all I could see was that their website is very confusing, they do not specify the size of deposit,website is not so easy to navigate with many hidden information, the only thing that is very easy to do is to open an account, but I was checking spreads and for majors like EUR/USD - GBP/ISD are unreal it can be till 4 pips, I will stop in their demo account, especially because their trading conditions are quite weird to me, as I told before many hidden information.